The World Health Organization is about to publish a report on how the palm oil industry is promoting obesity and chronic disease as well as environmental degradation as integral parts of its business model. The draft report gets right to the point. We highlight the industry’s mutually profitable relationship with the processed food industry and its impact on human and planetary health, including detrimental cultivation practices that are linked to respiratory illnesses, deforestation, loss of biodiversity and pollution. This analysis illustrates many parallels to the contested nature of practices adopted by the alcohol and tobacco industries. The research behind the report supports the analytical framework for examining industry’s effects on health. You don’t get why palm oil raises health and environmental concerns? Read this. Now. Nobody should be surprised by the results of the latest WHO report on the lack of progress in curbing the marketing of highly processed junk foods to children. The report looks at marketing policies across WHO Europe’s member countries. The data show that while about half the countries have taken some steps to limit junk food marketing to kids, even these steps do not go nearly far enough. Advertising but ignore other methods for reaching children. Children up to age 12 or 13, but not others. The report notes the need for more consistent definitions and regulations across the various countries, especially with respect to digital media. The report documents the negative effects of highly processed foods on kids’ health. It also documents the uphill nature of addressing this problem. From the standpoint of the food industry, marketing to children in the line in the sand. They cannot stop marketing to kids and still sell junk foods aimed at kids. The report provides plenty of evidence for food companies’ prioritizing profit over public health. By this time, you have no doubt heard about the Trump Administration’s attempts to stop the World Health Organization from promoting breastfeeding. Incredible but true. Here is a brief timeline of how this story got out. May 25 Lucy Sullivan, executive director o 1000 Days (the first 1000 days of life are critical to an infant’s survival) sent out a tweet warning of a battle brewing over breastfeeding at WHO’s World Health Assembly, where countries are negotiating a resolution on infant and young child feeding. The Americans were blunt: If Ecuador refused to drop the resolution, Washington would unleash punishing trade measures and withdraw crucial military aid. The Ecuadorean government quickly acquiesced….The confrontation was the latest example of the Trump administration siding with corporate interests on numerous public health and environmental issues. Ironically, Russia stepped in and introduced the measure, which passed despite US attempts to block it. Infant formula works for babies, but breastfeeding is demonstrably better. This is especially true for women who cannot afford formula, do not have clean water to dilute the powder properly, or lack refrigeration to store formula properly. Infant formulas cause controversy and are endlessly contentious for three important reasons. Formulas are (1) largely unnecessary (most mothers can breast feed their infants), (2) not as perfect as breast milk for feeding babies, and (3) more expensive than breast feeding. Breast milk is nutritionally superior to formula, but from a marketing standpoint it has one serious disadvantage: it is free. Beyond one-time purchases of breast pumps, storage bottles, or special clothing, nobody makes money from it. Formula companies are happy to pay lip service to “breast is best,” as long as policies do not promote breastfeeding over formula. This is not the first time the US has taken this position. In 1981, when the United Nations developed the International Code of Marketing of Breast-Milk Substitutes, all of its member countries agreed to abide by the Code except for the United States and South Africa. Eventually, South Africa signed on. The U.S. was the last hold out and did not agree to abide by the Code until 1994. Why not? Because the Code could set a precedent that might adversely affect U.S. corporations. The Washington Post (“US efforts”) and The Atlantic (“epic battle”) review this history. As I also explained in What to Eat, only about 4 million babies are born in the US each year, meaning that the formula market is limited and static. That is why formula companies work so hard to convince mothers that breastfeeding is too difficult, unsanitary, inefficient, and ineffective to continue, and that they would be better off switching to formulas and staying on formulas long past the time when babies should be eating solid foods. Georges Benjamin, executive director of the American Public Health Association (in an interview with Food Chemical News). Add this to the growing list of ways the Trump Administration favors corporate interests over public health. Alas. Three of the largest infant formula companies — U.S.-based Abbott Laboratories, Swiss-based Nestle, and U.K.-based Reckitt Benckiser — have spent $60.7 million lobbying U.S. lawmakers and officials during the last decade….While the New York Times reported that the formula manufacturers didn’t play a visible role in the debate over the WHO resolution, lobbying records show they have a significant Capitol Hill presence that often extends beyond infant nutrition. 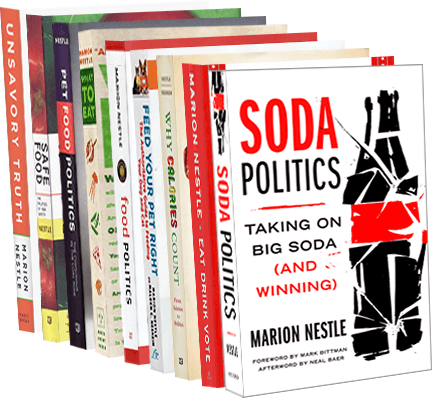 The AP reports that the reason the WHO committee on preventing noncommunicable diseases (NCDs) did not recommend soda taxes is that the US representative vetoed the idea. The Trump administration has torpedoed a plan to recommend higher taxes on sugary drinks, forcing a World Health Organization panel to back off the U.N. agency’s previous call for such taxes as a way to fight obesity, diabetes and other life-threatening conditions. The move disappointed many public health experts but was enthusiastically welcomed by the International Food and Beverage Alliance — a group that represents companies including Coca-Cola, PepsiCo. and Unilever. The Commissioners represented rich and diverse views and perspectives. There was broad agreement in most areas, but some views were conflicting and could not be resolved. As such, some recommendations, such as reducing sugar consumption through effective taxation on sugar-sweetened beverages and the accountability of the private sector, could not be reflected in this report, despite broad support from many Commissioners. Implement fiscal measures, including raising taxes on tobacco and alcohol, and consider evidence-based fiscal measures for other unhealthy products. In 2015, WHO recommended that sugars be consumed at less than 10% of calories. In 2016, WHO recommended taxes on sugary drinks as a way to reduce sugar intake and prevent NCDs. Again a US veto? Recall the infamous incident in 2003 when the US blocked the agency from recommending a reduction in sugar intake. The US should not be holding WHO hostage to public health measures. WHO should not be caving in to US threats. NCDs are the major cause of worldwide death and disability and we need worldwide efforts to prevent them. This calls for cooperation, not blackmail. I say brave because marketing to children is the food industry’s line in the sand. Food and beverage companies will not stop marketing to children because doing so will hurt their bottom lines too much. Children’s participation in digital media should not, however, be predicated on receiving digital HFSS [high in saturated fats, salt and/or free sugars] advertising. Digital marketing can amplify the power of earlier marketing practices by identifying and targeting more vulnerable populations with sophisticated analytics and creating engaging, emotion-focused, entertaining ways to reach children. Nor should children’s digital participation be predicated on “devolving” consent to parents, which is akin to States expecting parents to completely prohibit their children from watching all television in order to avoid HFSS marketing, rather than implementing broadcast regulations. Instead, States and supra-national actors should devise ways to allow children to participate in the digital world without being targeted by marketers with immersive, engaging, entertaining marketing of products that have been demonstrated to be injurious to their health. Now if governments would just listen…. PAHO issues nutrition standards for ultraprocessed foods. Beverage Associations object. Cheers to the Pan American Health Organization/World Health Organization for releasing nutritional profile standards for making it easier for governments to distinguish fresh and minimally processed foods from ultraprocessed. The idea here is to encourage populations to consume traditional diets (see press release). Excessive sodium if the ratio of sodium (in milligrams) to calories (kcal) is 1:1 or higher. Identify foods to be provided by social programs to vulnerable groups. We agree that obesity is a global health challenge, and ICBA and its members welcome the opportunity to work with PAHO and other stakeholders to pursue effective and practical solutions. There are some areas, however, where we believe that use of PAHO’s Nutrient Profile Model may not provide helpful guidance to consumers. There is not current scientific consensus in all areas that the Nutrient Profile Model addresses. It will not be useful if families find that nearly 80% of the foods and beverages in their grocery carts are unacceptable. Such a radical message is not likely to be followed by most individuals…we encourage governments and scientific bodies to offer food and dietary recommendations and national policies that are based on the totality of scientific evidence and provide realistic, positive encouragement to consumers to have a real impact promoting healthful diets and preventing obesity and non-communicable diseases. The PAHO profiles may need tweaking, but they are a great first step. Now let’s see how they get implemented.